Jurisdiction with legal non-psychoactive medical cannabis. ---- 1 Includes laws which have not yet gone into effect. 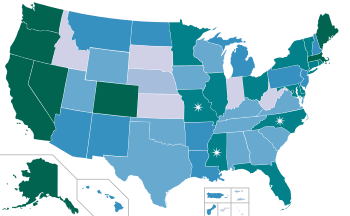 2 Marked states have only legal non-psychoactive medical cannabis. ---- * Cannabis remains a Schedule I substance under federal law as of 2015. * Some cities and Indian Reservations have legalization policies separate from their surrounding states. * Cannabis is illegal in all Federal enclaves. Decriminalization of non-medical cannabis in the United States has been attempted since the 1970s. As views on cannabis (or marijuana) have liberalized, over half of the states have either approved it for medical use, decriminalized it for recreational use, or completely legalized it and approved it for retail sale. Between 1973 and 1978, eleven states decriminalized marijuana, but after 1978 decriminalization in the U.S. ground to a halt. Not until 2001 did another state, Nevada, reduce marijuana possession to a misdemeanor. Since 2012, several other states have decriminalized and even legalized marijuana, ushering in a new chapter in the history of the decriminalization. Proponents of decriminalization argue that legalizing cannabis would free billions of dollars now used to prosecute users, provide several billions in tax revenue, free a substantial amount of law-enforcement resources which could be used to prevent more serious crimes, free a substantial amount of prison resources, and reduce the income of street gangs and organized crime who grow, import, process, and sell cannabis. Opponents argue that cannabis on the street today has a much higher percent of THC with a stronger drug effect, and that decriminalization will lead to usage, increased crime, and abuse of actual dangerous illicit drugs. Cannabis remains on the Schedule I list of controlled substances under U.S. federal law. In 2005, the U.S. Supreme Court ruled 6-3 in Gonzales v. Raich that the Commerce Clause and Supremacy Clause of the U.S. Constitution allowed the federal government to ban the use of cannabis (including medical use) because federal law is "supreme" and trumps state law to the contrary. 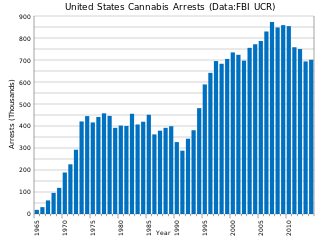 U.S. cannabis arrests by year. Multiple states, counties, and cities have decriminalized cannabis. They may require drug education, or drug treatment in place of incarceration, and/or criminal charges for possession of small amounts of cannabis, or have made various cannabis offenses the lowest priority for law enforcement. After the 1960s, an era characterized by widespread use of cannabis as a recreational drug, a wave of legislation in United States sought to reduce the penalties for the simple possession of cannabis, making it punishable by confiscation and a fine rather than imprisonment or more severe charges. In 1972, President Richard Nixon commissioned a study on cannabis use from the National Commission on Marijuana and Drug Abuse. The Commission found that the constitutionality of cannabis prohibition was suspect, and that the executive and legislative branches had a responsibility to obey the Constitution, even in the absence of a court ruling to do so. The Nixon administration did not implement the study's recommendations. However, the report has frequently been cited by individuals supporting removal of cannabis from Schedule I of the Controlled Substances Act. In 1973, Oregon became the first state to decriminalize cannabis possession. By 1978 Alaska, California, Colorado, Mississippi, New York, Nebraska, North Carolina, and Ohio had some form of cannabis decriminalization. Certain cities and counties, particularly in California, have adopted laws to further decriminalize cannabis. In 1974, A Senate Internal Security Subcommittee, chaired by Sen. James O. Eastland on The Marijuana-hashish epidemic and its impact on United States security state that evidence accumulated by scientific researchers on cannabis had turned dramatically against this drug. Further legalization came in 2012 as two of three measures on the November 6 general ballot succeeded by wide margins. Washington Initiative 502 (2011) and Colorado Amendment 64 (2012) passed in the general election, as Oregon Ballot Measure 80 (2012) failed. Both of the successful measures restricted cannabis possession to adults aged 21 or over, restricted the total amount allowed and included a "DUID" provision against driving under the influence of marijuana. Both explicitly regulated cannabis much like hard liquor has been regulated since the end of prohibition in the United States, and explicitly avoided any changes to medical cannabis law. Initiative 502 defined marijuana based on its THC content and regulated all growth, processing and sale of marijuana under the Washington State Liquor Control Board, with strict restrictions against public consumption of marijuana. The Colorado measure, by contrast allowed private "home grows" in addition to commercial regulation. The failed Oregon law, by contrast, established a new state agency to regulate and tax cannabis, but was less specific and allowed possession for all adults, aged 18 or older. In 2005, Gonzales v. Raich, ruled in a 6-3 decision that the Commerce Clause of the United States Constitution allowed the federal government to ban the use of cannabis, including medical use, federal law strike state law. On November 7, 2000, voters in Alaska rejected Measure 5 by 60–40 percent. Measure 5 would have removed civil and criminal penalties for use of cannabis or other hemp products by adults age 18 and older and would have regulated the sale of cannabis similar to the sale of alcoholic beverages. On November 2, 2004, voters in Alaska rejected Measure 2 by 56–44 percent. Measure 2 would have prompted the state legislature to tax and regulate cannabis, and would have removed criminal penalties for cannabis use by adults aged 21 and older. On November 4, 2014, voters in Alaska approved Measure 2 by 52-48 percent. As a result of its passage, the measure will allow people age 21 and older to possess up to one ounce of marijuana and up to six plants. It will also make the manufacture, sale and possession of marijuana paraphernalia legal. These changes will be implemented at the state level; however, these acts will still remain illegal under federal law. In January 2011, ``Republican first-year Arizona legislator John Fillmore introduced House Bill 2228. This bill would decriminalize cannabis possession of 2 ounces or less to a petty offense with a penalty of no more than a $100 fine, similar to the laws in Colorado, California, etc. “ (1) No person in the State of California 18 years of age or older shall be punished criminally, or be denied any right or privilege, by reason or such person's planting, cultivating, harvesting, drying, processing, otherwise preparing, transporting, or possessing marijuana for personal use, or by reason of that use. (2) This provision shall in no way be construed to repeal existing legislation, or limit the enactment of future legislation, prohibiting persons under the influence of marijuana from engaging in conduct that endangers others. On January 1, 1975, Senate Bill 95 made possession under one ounce of marijuana for non-medical use punishable by a $100 fine; stricter punishments exist for amounts exceeding an ounce, possession on school grounds, or subsequent violations or for sale or cultivation. If the offender is under the age of 21, his or her driver license may be suspended for up to one year. In Mendocino County, voters in 2000 approved Measure G, which called for the decriminalization of cannabis when used and cultivated for personal use. Measure G passed with a 58 percent majority vote, making it the first county in the United States to declare prosecution of small-scale marijuana offenses the "lowest priority" for local law enforcement. Measure G does not protect individuals who cultivate, transport or possess cannabis for sale. However, Measure G was passed at the local government level affecting only Mendocino County, and therefore does not affect existing state or federal laws. The city of Berkeley has had a similar law since 1979 which has generally been found to be unenforceable. On June 3, 2008, the Mendocino County Board of Supervisors placed Measure B on a county-wide ballot. Voters narrowly approved "B", which repealed most of the provisions of 2000's Measure G. On July 3, 2008, the Sheriff and District Attorneys offices announced that they would not be enforcing the new regulations for the time being, citing pending legal challenges and conflicts with existing state law. On September 30, 2010, California Gov. Arnold Schwarzenegger signed into law S.B. 1449, a bill that decriminalizes the possession of up to one ounce of marijuana . The bill reduces simple possession from a misdemeanor to an infraction. This would eliminate the need to appear in front of a court and would treat possession of less than 28.5 grams like a traffic ticket, punishable by $100. In 2010, Proposition 19, titled the "Regulate, Control, and Tax Cannabis Act of 2010", qualified for the November California ballot. It was rejected by 54% of the voters. This initiative would have legalized the recreational use of cannabis and its related activities in the State of California. It also would have allowed local governments to regulate and tax the newly created cannabis market. On November 6, 2012, the Campaign to Regulate Marijuana Like Alcohol, a ballot initiative campaign backed by the Marijuana Policy Project, successfully passed Amendment 64, making Colorado the only place in the U.S to have legalized the possession, use, production, distribution, and personal cultivation of marijuana. The Marijuana Policy Project also played a lead role in drafting and campaigning for the historic initiative. Following the passage of Amendment 64, Colorado enacted a complicated legislative scheme to regulate the cultivation, distribution, retailing and consumption of marijuana for Coloradans and visitors alike. Several counties in neighboring states have observed an increase of trafficking of marijuana, into their jurisdictions from Colorado, where it remains illegal; these counties have observed an increase of cost relating to prosecution of alleged traffickers. It unclear whether this increase is a result of Colorado's policy change, as some agencies report an increase of trafficking while others do not. Prior to the change in Colorado's laws regarding marijuana, there has been a decade-long trend of increasing marijuana trafficking. In 2006 a proposed amendment, Amendment 44, was rejected by 59 percent of the voting population. Amendment 44 would have legalized possession of 28.45 grams (approximately one ounce) or less by adults age 21 and older. Prior to November 6, 2012, the cities of Breckenridge and Denver had passed measures to make possession of up to one ounce of cannabis legal, although possession was still a crime under state and federal law. House Bill 39 (“HB 39”) takes effect for all marijuana offenses committed on or after 12:01 a.m. December 18, 2015. “The purpose of this bill is to decriminalize the possession or private use of a personal use quantity of marijuana.”1 To meet this purpose, Delaware’s drug laws were amended to create a “civil penalty” for private use or possession of a “personal use quantity” of marijuana. On March 31, 2014, D.C. Mayor Vincent Gray signed legislation to end arrests for marijuana possession in the nation's capital. The legislation took effect at midnight, 17 July 2014, following the mandated 60-day review by the Congressional Oversight Panel. The bill, sponsored by Ward 6 council member Tommy Wells, removed all criminal penalties for possession of up to an ounce of marijuana and replaced them with a civil fine of $25. Police also no longer have grounds to search individuals solely based on the smell of marijuana. Outside of Colorado and Washington, the District of Columbia thus enacted the least punitive marijuana laws in the country. In April 2014, the DC Cannabis Campaign began soliciting petition signatures for Initiative 71, to legalize marijuana in the District. On 7 July 2014 the campaign claimed to have submitted over 57,000 signatures to the Board of Elections, more than twice the number needed to qualify for the November ballot. A January 2014 poll by the Washington Post indicated that 63% of DC residents favored legalizing marijuana; the Post noted that African American support for legalization had increased from 37% in 2010 to 58% in 2014. A September 2014 poll by the Post found that support for legalization had continued to increase, with legalization leading by "an almost 2-to-1 margin". The New York Times recommended a "Yes" vote on the initiative in an editorial. Initiative 71 was put on the ballot in November 2014. The initiative would allow the possession up to two ounces of marijuana for one's own use, and allow growing up to six cannabis plants in one's own home of which three or fewer may be mature and flowering simultaneously. The initiative would also allow an adult to give, not sell, up to an ounce of marijuana to another adult. The initiative would not apply to federal property, where marijuana possession would continue to be illegal under federal laws. Initiative 71 passed, with 65% of votes in favor. In December 2014, the United States Congress, which has authority over the District of Columbia, voted to add language in a spending bill that prohibits the Government of the District of Columbia from spending both federal and local funds to "enact" a referendum legalizing recreational marijuana use in the District of Columbia. The Chairman of the Council of the District of Columbia, Phil Mendelson followed the typical procedure for a voter-approved referendum and sent a bill implementing Initiative 71 to Congress for a 30-day review, during which Congress may vote to veto it, which would lapse on February 26, 2015. The Government of the District of Columbia is taking the position that the initiative was enacted the day that voters approved it, and therefore the District of Columbia does not need to spend any further money to enact the law and will not violate the Congressional law. Several members of Congress disagree with that position, saying that the District of Columbia must continue to enforce the law at it was prior to the vote on Initiative 71, and doing anything else is illegal. On January 27, 2014, the Florida Supreme Court approved the ballot language for a proposed constitutional amendment allowing the medical use of marijuana, following a successful petition drive. The amendment proposal appeared on Florida's November 2014 general election ballot and failed to pass. Polls show broad support for the legalization of medical marijuana among those living in Florida. Marijuana has been decriminalized in the city of Tampa as well as Miami-Dade, Broward, Palm Beach and Volusia counties. On July 29, 2016, Illinois Gov. Bruce Rauner signed a law decriminalizing possession of marijuana, making the state the 21st and third largest in the nation to do so. Under the new law, possession of 10 grams of marijuana or less is now punishable by fines of $100 to $200, instead of jail time. It also decriminalizes related offenses involving the possession of marijuana paraphernalia. On April 14, former Maryland Gov. Martin O'Malley signed legislation to remove criminal penalties from possession of small amounts of marijuana. Beginning October 1, 2014, the decriminalization bill (SB 364) imposes civil fines — not criminal penalties and possible jail time — on those possessing less than 10 grams of marijuana. On November 4, 2008, 65% of Massachusetts voters voted 'yes' on ballot question 2 known as the Massachusetts Sensible Marijuana Policy Initiative, which became law on January 2, 2009, reduced the penalty for possession of an ounce or less of cannabis from the previous misdemeanor punishable by up to 6 months in jail and $500 fine to a civil infraction and a fine of $100, as well as prevent the inclusion of the citation into the CORI criminal records database which is used by law enforcement and employers to conduct background checks and jeopardizes the person's ability to obtain jobs, housing, and school loans. It also requires people under the age of 18 to have their parents notified and do community service, as well as receive drug awareness counseling or have the fine increased to $1000. House Bill 2929 and Senate Bill 1801 were introduced in January 2009 which seeks to legalize and tax the cannabis industry. Since the early 1970s, an Ann Arbor ordinance and charter amendment have made possession of small amounts of cannabis a civil infraction, subject to a small fine, rather than a misdemeanor or felony, and local law enforcement officers have been directed not to pursue charges under state and federal law. However, more stringent state laws are enforced on the University of Michigan campus in Ann Arbor. (See Cannabis laws in Ann Arbor, Michigan). In 2012, ballot proposals in the cities of Detroit, Grand Rapids, and Flint enacted provisions similar to those in Ann Arbor, and Ypsilanti passed an ordinance to make marijuana offenses the lowest priority for law enforcement officers. In 2013, voters in Lansing, Ferndale, and Jackson approved initiatives allowing citizens at least 21 years old to possess an ounce or less of marijuana on private property. In August 2014, voters in Hazel Park and Oak Park voted to approve a similar measure. On November 4, 2014, voters in Berkley, Huntington Woods, Mt. Pleasant, Pleasant Ridge, Port Huron, and Saginaw also passed a similar measure. The Michigan Medical Marijuana Act of 2008 gave Michiganders the legal right to cultivate and use cannabis for medical purposes with authorization from a physician. In 1976, Minnesota made it a petty misdemeanor to possess less than 42.5 grams of marijuana (approximately 1.5 ounces.) On May 29, 2014 Governor Mark Dayton (D) signed into law a bill establishing a medical marijuana program in the state. University of Mississippi is the only university in the country approved by the federal government to produce and research marijuana. According to NORML Mississippi has decriminalized marijuana to some degree. Typically, decriminalization means no prison time or criminal record for first-time possession of a small amount for personal consumption. The conduct is treated like a minor traffic violation. In 2014, a bill was passed by wide margins in the Missouri legislature to establish possession of small amount of marijuana as a minor "class D" misdemeanor subject to a fine, but for those previously convicted it would be a "class A" misdemeanor with a possible jail sentence. As of May 13, 2014, the governor had neither vetoed nor signed the bill. On November 5, 2002, voters in Nevada rejected Question 9 by 61-39 percent. Question 9 would have legalized possession of cannabis under 85.5 grams (3 ounces) by adults age 21 and older and would allow cannabis to be regulated, cultivated, sold and taxed. Question 9 would have also made low cost cannabis available for medical cannabis patients and would have created laws against "driving dangerously" under the influence of cannabis. On November 7, 2006, voters in Nevada rejected propositions that would have legalized possession of up to 28.45 grams (one ounce) of cannabis. In Nevada, Question 7 would have allowed adults 21 and older to purchase cannabis from government-regulated shops and possession of 28.45 grams or less in a private home would have been legalized, but the Question was rejected by 56-44 percent. In November 2014, the Coalition to Regulate Marijuana Like Alcohol turned in "200,000 signatures to get the [legalization of cannabis] issue on the 2016 ballot, nearly twice the number required by the state." The signatures were submitted by Nevada Senator Tick Segerblom. The petition resulted in Nevada Question 2, officially titled "Initiative to Regulate and Tax Marijuana." The measure, to appear on the November 8, 2016 ballot, would legalize possession of up to one ounce of cannabis for adults over the age of 21. On May 1, 2008, the New Hampshire Senate voted down a bill that would have reduced the penalty for the possession up to a quarter-ounce of cannabis from a misdemeanor to a violation punishable by a fine of no more than $200. This bill had previously passed the N.H. State House of Representatives and had the support of the majority of polled voters. In 1973, Oregon became the first state to decriminalize cannabis. Possession of 28.45 grams (1 ounce) or less is punishable by a $500 to $1,000 fine; stricter punishments exist for sale or cultivation. Criminal penalties were further reduced by the legislature in 2013. In 1986, Oregon's Ballot Measure 5 sought to legalize cannabis, but it was rejected by 74% of the voters. In 2012, the second ballot measure aimed at legalizing cannabis in the state appeared on the ballot as Measure 80 where it failed with 53% of voters opposing the initiative. On November 4, 2014, Oregon became the third state to legalize recreational Cannabis, through Measure 91 with 54% in favor of the Measure. The City of Philadelphia decriminalized possession of up to 30 grams of marijuana effective October 20, 2014, becoming the largest city in the United States to decriminalize marijuana. The City of Pittsburgh decriminalized possession of up to 30 grams of marijuana, or up to 8 grams of hashish on December 21, 2015. However, paraphernalia laws are unchanged, and penalties can result in a maximum 12 month incarceration and a $2,500 fine. A bill decriminalizing small amounts of cannabis has been signed into law by Gov. Lincoln Chafee, reports the Providence Journal. The law makes possession of less than an ounce of cannabis a civil violation with a $150 fine, although three violations in 18 months would be a misdemeanor with larger fines and the risk of prison time. Fourteen other states have introduced similar laws. Half of the fines collected will be spent on drug awareness and treatment programs for young people under the law, which was overwhelmingly approved by the state's General Assembly. The law, which takes effect April 1, 2013, replaces one which made cannabis possession punishable with up to a year in jail or a $500 fine. Harvard economist Jeffrey Miron estimates that the move will save Rhode Island up to $11 million a year. On June 6, 2013, Vermont became the 17th state to decriminalize marijuana. Governor Peter Shumlin signed a bill that made possession of less than an ounce of the drug punishable by a small fine rather than arrest and possible jail time. On November 6, 2012 voters passed Initiative 502 to remove criminal penalties for possession of quantities up to 1 ounce (28 g) of unprocessed "useable marijuana", up to 16 ounces (450 g) of infused products in solid form, or up to 72 ounces (2,000 g) of infused products in liquid form; and to license, regulate and tax cannabis production and sales under the authority of the Washington State Liquor Control Board. In 2003, Seattle voters approved an initiative requiring the Seattle Police Department and City Attorney's Office to make the investigation, arrest and prosecution of marijuana offenses, where the marijuana was intended for adult personal use, the City's lowest law enforcement priority. The Personal Use of Marijuana by Responsible Adults Act of 2008 was introduced in the 110th United States Congress and represents the first attempt to decriminalize possession of small amounts of cannabis at the federal level to be introduced in many decades. The bill was reintroduced in the 111th United States Congress as the Personal Use of Marijuana by Responsible Adults Act of 2009. In the 112th United States Congress, Rep. Barney Frank proposed H.R. 2306 Ending Federal Marijuana Prohibition Act of 2011. As of June 2011, this bill has been referred to committee pending vote in the House. Marijuana (cannabis) is an herb drug, which contains a very active component delta-9-tetrahydrocannabinol (THC). For thousands of years, it was used for medical purposes in many different parts of the world. Recent studies also agreed that THC had great potential benefits for medical purposes. A number of patients who have HIV, multiple sclerosis (MS), neuropathic chronic pain and cancer were under medical marijuana treatment. The treatments could either be smoke on cannabis or oral preparations, which were synthetic THC and synthetic equivalent. A study in the Journal of Policy Analysis and Management by Mark Anderson and Daniel Reese indicated that increased marijuana use in California is a substitute for alcohol. This research showed that participants frequently choose marijuana over other substances. They reported that over 41 percent of the people said that they prefer to use marijuana instead of alcohol. Some of the main reasons for this substitute were ‘less withdrawal’, ‘fewer side-effects’ and ‘better symptom management’. California Secretary of State’s office said that on September 7, 2010 the beer lobby donated $10,000 to Public Safety First, a group which opposed the passage of Proposition 19 to legalize cannabis. Cannabis has been subject to many studies over the past century. Studies acknowledge that cannabis can in rare cases cause adverse reactions, but is generally safer than any commonly consumed drug such as alcohol, tobacco and pharmaceuticals. In fact, in an article published in 'The Lancet' journal about the adverse health effects of non-medical cannabis use, Professors Hall and Degenhardt clearly stated that “the public health burden of cannabis use is probably modest compared with that of alcohol, tobacco, and other illicit drugs.” Psychopharmacologist David Nutt argues, though he is against full declassification, that the harm caused by cannabis is far less than that caused by alcohol or tobacco, which, if they were invented today "would be illegal.",. Teen use of marijuana in the Netherlands where it is sold legally and openly is lower than in the United States. Soros efforts to reform marijuana laws were predated by fellow billionaire, the late Peter Lewis. Lewis was the former chairman of Progressive Insurance and died November 23, 2013. Lewis is considered to be the most high-profile billionaire backer of drug reform and the National Organization for the Reform of Marijuana Laws (NORML) estimated that Lewis had spent well over $40 million funding the cause since the 1980s. During the November 2012 election, he spent almost $3 million helping secure the passage of marijuana legalization bills in both Washington state and Massachusetts. The list of capitalists who have joined Soros and Lewis in the cause of Marijuana reform include John Sperling, who is the founder of the University of Phoenix and George Zimmer who is the founder and former CEO of Men’s Wearhouse. Sperling donated $70,000 to support marijuana law reform in Oregon, and Zimmer contributed $20,000 to advocate for marijuana decriminalization in California. The ACLU takes a firm position that decriminalizing cannabis will keep tens of thousands of people from entering into the criminal justice system as police efforts result in both unnecessary arrests and the enforcement of marijuana laws wastes billions of tax payers’ dollars. They affirm that removing criminal penalties for marijuana offenses will therefore reduce the U.S. prison population and more effectively protect the public and promote public health. One of the reasons that the ACLU has been such a strong supporter of drug decriminalization is that according to their research drug related arrests have largely driven America’s incarceration rate to unacceptable levels. Drug offenders comprise over 500,000 of the more than 2 million people in America’s prisons and jails, and drug offenses combined with failed drug tests account for a significant number of those returning to prison for parole and probation violations. Between 2001 and 2010, there were over 7 million pot arrests in the U.S. and of these arrests 88% were for simply having marijuana. These marijuana related arrests now account for over half of all drug related arrests in the United States. These arrests tend to be racially imbalanced as a black person is 3.73 times more likely to be arrested than a white person for marijuana related charges, despite research that suggests fairly equal usage rates between the two races. The ACLU is further troubled by the amount of money that is spent annually to enforce marijuana laws as they claim that over 3 billion dollars are spent every year by states to enforce marijuana regulation, while the drug’s availability has not declined. The ACLU claims that over 50% of Americans support marijuana legalization and they are advocating for the legalization of Cannabis through the Criminal Law Reform Project. They believe that the resources that are spent on enforcing marijuana law could be better invested in our communities through education and job training. There are claims of historical evidence showing that a significant reason for marijuana ban by US government was political and racist in nature, aimed to suppress Black and Mexican minorities. A quote from 1934 newspaper :"Marihuana influences Negroes to look at white people in the eye, step on white men’s shadows and look at a white woman twice." Loo, Hoorens, Hof and Kahan also talked about this issue in their book ‘Cannabis policy, implementation and outcomes’. According to them, statistics show that controlling cannabis use leads in many cases to selective law enforcement, which increases the chances of arresting people from certain ethnicities. For example, while Blacks and Hispanics constitute about 20% of cannabis users in the US, they accounted for 58% of cannabis offenders sentenced under federal law in 1994. Studies conducted in Oregon, California, and Maine within a few years of decriminialization found little increase in cannabis use, compared to the rest of the country; "The most frequently cited reasons for non-use by respondents was 'not interested,' cited by about 80% of non-users. Only 4% of adults indicated fear of arrest and prosecution or unavailability as factors preventing use." Ron Paul, a Texas Congressman and 2008 Presidential Candidate, stated at a rally in response to a question by a medical cannabis patient that he would "never use the federal government to force the law against anybody using marijuana." In his book, The Revolution: A Manifesto he writes, "Regardless of where one stands on the broader drug war, we should all be able to agree on the subject of medical marijuana. Here, the use of an otherwise prohibited substance has been found to relieve unbearable suffering in countless patients. How can we fail to support liberty and individual responsibility in such a clear cut case? What harm does it do to anyone else to allow fellow human beings in pain to find the relief they need?" He is also the cosponsor of the Personal Use of Marijuana by Responsible Adults Act of 2008. Some members of religious organizations, even while not necessarily being in favor of marijuana consumption, have also spoken in favor of reform, due to medical reasons, or the social costs of enforcement and incarceration. For instance, Revered Samuel Rodriguez of National Hispanic Christian Leadership Conferences stated that “laws that prohibit marijuana affect the minorities significantly and hence should be reconsidered.” Religious groups uphold that marijuana does not harm as much as alcohol does and thus legalizing it for medicinal usage would not be harmful to the economy. ↑ Dionne Jr., E.J. (2013-05-29). "The dramatically changing politics of marijuana". The Washington Post. Nash Holdings LLC. Retrieved 20 April 2015. ↑ "Department of Public Health and Environment". ↑ Hardaway, Robert M. No Price Too High: Victimless Crimes and the Ninth Amendment, 2003. Page 94. ↑ Peter De Marneffe and Douglas N. Husak. The Legalization of Drugs, 2005. Page 8. ↑ "Reed Irvine: THE MEDIA AS DRUG PROMOTERS, AIM Report January 1986". Aim.org. Retrieved 2011-04-20. ↑ "Marihuana-hashish epidemic and its impact on United States security : hearings before the Subcommittee to Investigate the Administration of the Internal Security Act and Other Internal Security Laws of the Committee on the Judiciary, United States Senate, Ninety-third Congress, second session [-Ninety-fourth Congress, first session] .. (1974)". Archive.org. 2001-03-10. Retrieved 2014-05-03. ↑ "WGBH educational foundation. Interview with Dr. Robert Dupoint". Pbs.org. 1970-02-18. Retrieved 2011-04-20. ↑ "Robert DuPont: Why We Should Not Legalize Marijuana, CNBS, 20 Apr 2010". Cnbc.com. 2010-04-20. Retrieved 2014-05-03. ↑ "Ballot Measure Results for States". CNN. 2000. Archived from the original on December 22, 2006. Retrieved 2007-03-21. ↑ "Marijuana Initiatives: November 2004". MPP. Archived from the original on March 8, 2007. Retrieved 2007-06-22. ↑ "marijuana proposition 19". Cognitiveliberty.org. Retrieved 2010-09-15. 1 2 Austin, James (2005-11-02). "Rethinking the Consequences of Decriminalizing Marijuana" (PDF). NORML. Retrieved 2006-12-24. ↑ "State by State Laws: California". NORML. 2006. Retrieved 2007-01-10. ↑ "Legal Limbo for Pot Users? By SUZANNE LA BARRE. Category: Features from The Berkeley Daily Planet". ↑ "Mendocino County Marijuana Personal Use Ordinance, Measure B (June 2008)". ↑ "It's official: Marijuana reform effort passes". Ukiah Daily Journal". Retrieved 2011-04-20. ↑ "Mendocino County won't enforce pot measure". The Press Democrat. 2008-07-03. Retrieved 2011-04-20. ↑ "Senate Bill 1449 attached signing message by Gov. Arnold Schwarzenegger". California: gov.ca.gov. 2010-10-01. Archived from the original on October 5, 2010. Retrieved 2010-10-01. ↑ "State Ballot Measures - Statewide Results". California Secretary of State. Retrieved 2010-11-03. ↑ "yeson19.com". Taxcannabis.org. Retrieved 2010-09-15. ↑ Phil Tenser (2012-11-07). "Out-of-state money funded push to pass Amendment 64 and legalize marijuana in Colorado - 7NEWS Denver". Thedenverchannel.com. Retrieved 2014-05-03. ↑ "Visiting Colorado and Marijuana - what toking tourists need to know - North Denver News". North Denver News. Retrieved 28 February 2015. ↑ Burke, Kelly David (6 June 2014). "Colorado the new 'black market'? Pot legalization causing headaches for surrounding states". Fox News. Retrieved 8 September 2014. ↑ Ferner, Matt (2014-05-28). "Keep Your Legal Weed In Colorado, Say Cops In Neighboring States". Huffington Post. Retrieved 8 September 2014. It's unclear to what extent this is actually a problem: While some authorities in Nebraska, Oklahoma and Kansas have reported an uptick in marijuana-related busts, different police in those states and others say they haven't seen any new issues arise. ↑ Ferner, Matt (2014-05-28). "Keep Your Legal Weed In Colorado, Say Cops In Neighboring States". Huffington Post. Retrieved 8 September 2014. Experts say there's not yet enough data to tell whether Colorado's experiment with legal pot has truly caused a surge in trafficking to neighboring states. And if there has been an increase, it may simply be an extension of a nearly decade-long trend. A 2013 report from the federally funded Rocky Mountain High Intensity Drug Trafficking Area program found that between 2005 and 2012, there was a 407 percent increase in seizures of marijuana headed to other states. And back in 2012, Colorado post offices had already reported climbing numbers in marijuana packages intended to be mailed out of the state. ↑ "Ballot Measures: Colorado Amendment 44". CNN. Retrieved 2007-03-20. ↑ "Gray Signs Bill Decriminalizing Marijuana". WAMU 88.5. ↑ DeBonis, Mike; Hermann, Peter (17 July 2014). "Decriminalization arrives, and D.C. police prepare for sea change in marijuana laws". Washington Post. Retrieved 19 July 2014. ↑ Nelson, Steven (23 April 2014). "Marijuana Legalizers Hit D.C. Streets: Green light for petition moves initiative closer to voters, who polls show want legalization.". US News. Retrieved 6 May 2014. ↑ Davis, Aaron C. (7 July 2014). "Marijuana advocates submit petition signatures for D.C. ballot initiative". Washington Post. Retrieved 14 July 2014. ↑ Davis, Aaron C. (15 January 2014). "In major shift, D.C. residents strongly support legalizing marijuana". Washington Post. Retrieved 14 July 2014. ↑ Davis, Aaron C. (18 September 2014). "Poll: D.C. voters poised to legalize pot, elevating national debate over marijuana". Washington Post. Retrieved 8 October 2014. ↑ "Yes to Marijuana Ballot Measures: Alaska, Oregon and the District of Columbia Should Legalize Pot". Washington Post. 5 October 2014. Retrieved 8 October 2014. 1 2 3 4 "Congressional Review Period Almost Over for D.C.'s Marijuana Legalization Bill". WNEW-FM. CBS Local Media. February 23, 2015. ↑ "General Election Certified Results". District of Columbia Board of Elections. December 3, 2014. ↑ Freed, Benjamin (December 11, 2014). "DC Marijuana Legalization Will Be Sacrificed to Keep Federal Government Running: President Obama will sign a government funding bill even though it blocks a widely popular District initiative". Washingtonian. ↑ Davis, Aaron C. (December 13, 2014). "D.C. maneuvering for marijuana showdown with Congress: The D.C. Council chairman plans to send a legalization measure to lawmakers in January". The Washington Post. 1 2 Davis, Aaron C. (February 15, 2015). "In D.C., fears of chaos grow as legal pot nears". The Washington Post. ↑ Nohlgren, Stephen (January 28, 2014). "Questions and answers about medical marijuana in Florida". Tampa Bay Times. Retrieved 28 January 2014. ↑ Nohlgren, Stephen (January 3, 2014). "Flurry of petitions propel medical marijuana toward Florida ballot". Tampa Bay Times. Retrieved 28 January 2014. ↑ Nohlgren, Steven (29 March 2016). "Florida's medical marijuana amendment: No slam dunk (w/video)". Tampa Bay Times. Retrieved 4 May 2014. ↑ "Decriminalization is sweeping Florida — one city at a time". Marijuana Policy Project. Retrieved 29 July 2016. ↑ "Massachusetts sensible marijuana policy". Committee for sensible marijuana policy. Archived from the original on June 28, 2008. Retrieved 2008-09-03. ↑ Miller, Joshua (8 November 2016). "Mass. voters say 'yes' to legalizing marijuana". Retrieved 11 November 2016. ↑ "Voters In Michigan Cities Back Marijuana Issues". Detroit.cbslocal.com. 2012-11-07. Retrieved 2014-05-03. ↑ "3 Michigan Cities Vote To Ease Marijuana Laws". Detroit.cbslocal.com. 2013-11-06. Retrieved 2014-11-05. ↑ "Hazel Park, Oak Park vote to green light marijuana". Www.myfoxdetroit.com. 2014-08-06. Retrieved 2014-11-05. ↑ "6 communities pass marijuana measures". Www.lansingstatejournal.com. 2014-11-05. Retrieved 2014-11-05. ↑ "Missouri "decriminalization" bill awaiting governor's signature". ↑ "Ballot Measures". CNN. Retrieved 2007-03-21. ↑ Ed Vogel (2002-11-06). "State voters reject legalizing marijuana". Las Vegas Review-Journal. Retrieved 2007-03-21. ↑ Jodi Else (2002). "CIR Report: Nevada Ballot Question 9". McGeorge School of Law. Archived from the original on September 2, 2006. Retrieved 2007-03-21. ↑ "Marijuana legalization measures fail in Colorado, Nevada, South Dakota". 2006-11-08. Retrieved 2006-11-08. ↑ "State Races: Nevada". CNN. Retrieved 2007-03-20. ↑ Chokshi, Niraj (November 13, 2014). "Nevada group turns in twice as many signatures as needed to get pot legalization on ballot". The Washington Post. Retrieved 2016-07-30. ↑ "marijuana decriminalization bill fails; local Dems join Dean at state convention". The Wire. Archived from the original on May 30, 2008. Retrieved 2008-08-04. ↑ Suellentrop, Chris (2001-02-15). "Which States Have Decriminalized MJ Possession?". Cannabis News. Retrieved 2010-10-12. ↑ "State by State Laws: Oregon". NORML. 2006. Retrieved 2007-01-10. ↑ Robert Capecchi (2013-07-02). "Oregon Governor Signs Marijuana Policy Reforms Into Law". Marijuana Policy Project. Retrieved 2014-06-23. ↑ "History of Oregon Reform Efforts". Marijuanalibrary.org. Retrieved 2010-09-15. ↑ "Marijuana Votes: Oregon And D.C. Legalize; Florida Says No To Medical". npr.org. 2014-11-04. Retrieved 2014-11-04. ↑ "Philadelphia Decriminalizes Marijuana". Huffington Post. 2014-10-02. Retrieved 2015-02-25. ↑ "Pittsburgh decriminalizes pot possession". Pittsburgh Post-Gazette. 2015-12-21. Retrieved 2015-12-22. ↑ "Peasant Pittsburgh". Peasant Yogi. Retrieved 2016-01-27. ↑ "Vermont becomes 17th state to decriminalize marijuana, making possession of less than an ounce of pot punishable by fine". New York: NY Daily News. 2013-06-06. Retrieved 6 June 2013. ↑ "SUMMARY OF INITIATIVE 502 TO THE LEGISLATURE" (PDF). Washington State Legislature. May 16, 2012. Retrieved December 30, 2012. ↑ Seattle Municipal Code. "12A.20.060 Enforcement Priority -- Marijuana.". Retrieved 6 December 2012. ↑ Shankbone, David. "Interview with Nadine Strossen" Wikinews (2007-10-30). Retrieved on 2007-11-14. ↑ Bostwick, J. Michael (Feb 2012). "Blurred Boundaries: The Therapeutics and Politics of Medical Marijuana". Mayo Clinic Proceedings. 87 (2): 172–186. doi:10.1016/j.mayocp.2011.10.003. Retrieved Nov 6, 2015. 1 2 3 Maule, W.J. (4 March 2015). "Medical Uses of Marijuana (Cannabis Sativa): Fact or Fallacy?". British Journal of Biomedical Science. Retrieved Oct 11, 2015. ↑ "Endorsing Economists | Cost of Marijuana Prohibition: Economic Analysis". Prohibitioncosts.org. 2013-06-16. Retrieved 2013-07-06. ↑ "CNN/Money: State Marijuana Tax Revenues". 1 2 3 "Nevadans to vote on legalizing marijuana". MSNBC. 2006-10-17. Retrieved 2007-03-27. 1 2 "Report and Recommendations: Governor's Drug Policy Advisory Group". Drug Policy Alliance. January 2001. Retrieved 2007-03-20. ↑ "Savings in California Marijuana Law Enforcement Costs Attributable to the Moscone Act of 1976 - A Summary". www.marijuanalibrary.org. Retrieved 2007-03-20. ↑ James Austin (2005-11-02). "Rethinking the Consequences of Decriminalizing Marijuana" (PDF). The JFA Institute (published on NORML). Retrieved 2006-12-24. ↑ Hickman, John. "UNODC Makes the Case for Ending Cannabis Prohibition—Inadvertently". Baltimore Chronicle. Retrieved 2007-06-20. ↑ "Welfare Caseloads Total recipients (per capita) (most recent) by state". ↑ Ruschmann, J.D. (2004). Legalizing Marijuana, Paul Chelsea House Publishers. ↑ "National Drug Threat Assessment 2006". National Drug Intelligence Center. February 2005. Retrieved 2007-04-02. ↑ "National Drug Threat Assessment 2004". National Drug Intelligence Center. April 2004. Retrieved 2007-04-02. ↑ "California Northern and Eastern Districts Drug Threat Assessment". National Drug Intelligence Center. January 2001. Retrieved 2007-04-03. ↑ "Dean Becker". Law Enforcement Against Prohibition. Retrieved 2007-04-03. ↑ Ed Vogel (2006-04-11). "Legalization Initiative: Marijuana measure opposed". Las Vegas Review-Journal. Retrieved 2007-04-19. ↑ Paul Armentano (2012-12-26). "Is Marijuana an 'Exit Drug'? Study Suggests Some Are Taking It as a Substitute for Prescription Drugs and Alcohol". Alternet. Retrieved 2014-05-04. ↑ Naggourney, Adam; Lyman, Rick (October 26, 2013). "Few Problems With Cannabis for California". The New York Times. Retrieved 5 May 2014. ↑ J. Patrick Coolican (2013-10-03). "Beer Lobby Gives $10,000 To 'No' On Proposition 19 Pot Legalization". LA Weekly. Retrieved 2014-05-04. ↑ Nutt, D.; King, L. A.; Saulsbury, W.; Blakemore, C. (2007). "Development of a rational scale to assess the harm of drugs of potential misuse". The Lancet. 369 (9566): 1047–1053. doi:10.1016/S0140-6736(07)60464-4. PMID 17382831. ↑ "SAFER - Marijuana vs. Alcohol". Saferchoice.org. 2006-05-25. Retrieved 2013-07-06. ↑ "Marijuana smoke not as damaging to lungs as cigarette smoke, study suggests". Sciencedaily.com. 2012-01-11. doi:10.1001/jama.2011.1961. Retrieved 2013-07-06. ↑ "Marijuana versus Addictive Pharmaceuticals | Van Isle Medical Marijuana". Vimm.ca. Retrieved 2013-07-06. ↑ Hall, W.; Degenhardt, L. (2009). "Adverse Health Effects Of Non-medical Cannabis Use" (PDF). The Lancet. 374 (9698): 1383–1391. doi:10.1016/S0140-6736(09)61037-0. PMID 19837255. ↑ "Marijuana Arrests at All-Time High, Far Exceed Violent Crime Arrests". Umsl.edu. 2004-10-29. Retrieved 2010-09-15. ↑ "Unlocking America: Why and How to Reduce America's Prison Population". Decriminalizing Pot Will Reduce Prison Population, Have No Adverse Impact On Public Safety, Study Says. NORML. 21 November 2007. Retrieved 24 October 2014. ↑ Wolff, Madeline (9 November 2009). "Daily Sundial". Legalizing marijuana can reduce crime, increase revenue for state. The Sundial California State University Northridge. Retrieved 24 October 2014. 1 2 Szalavitz, Maia (2010-11-23). "Portugal's Drug Experience: New Study Confirms Decriminalization Was a Success | TIME.com". Healthland.time.com. Retrieved 2013-07-06. ↑ Downs, David (2011-09-22). "Going Dutch: Teen Marijuana Use in the US vs. Netherlands — the Full Interview with Cal Professor Robert MacCoun | Legalization Nation". Eastbayexpress.com. Retrieved 2013-07-06. ↑ "The Netherlands Compared With The United States". Drug War Facts. Retrieved 2013-07-06. ↑ "Regulate Marijuana like Wine". Libertarian Party. ↑ "Barney Frank, Ron Paul Pressure Obama on New Marijuana Laws". 14 November 2012. ↑ Chloe Sorvino (2014-10-02). "An Inside Look At The Biggest Drug Reformer In The Country: George Soros". Forbes. Retrieved 2015-02-25. ↑ Suzanne Goldenberg (2010-10-26). "George Soros gives $1m to California's pro-cannabis campaign". theguardian.com. Retrieved 2014-05-04. 1 2 3 Luisa Kroll (2013-11-24). "Billionaire Peter Lewis, Advocate Of Marijuana Legalization, Dies At 80". Forbes. Retrieved 2014-05-04. ↑ Zaid Jilani (2012-05-20). "Marijuana Advocates Spend Big and Defeat Drug War Proponent in Oregon". Truth-out.org. Retrieved 2014-05-04. ↑ Rob Reuteman (2010-04-20). "The Marijuana Lobby: All Grown Up". Cnbc.com. Retrieved 2014-05-04. 1 2 3 "ArcView Angel Investors Commit Over $1 Million to Marijuana Industry Start-ups at Seattle Event" (Press release). Online.wsj.com. 2013-05-02. Retrieved 2014-05-04. 1 2 3 4 5 "Marijuana Law Reform". American Civil Liberties Union. Retrieved 2014-05-04. 1 2 "Billions of Dollars Wasted on Racially Biased Arrests". American Civil Liberties Union. Retrieved 2014-05-04. 1 2 3 4 "Archived copy". Retrieved July 14, 2014. ↑ "The War on Marijuana in Black and White: Report". American Civil Liberties Union. 2013-06-03. Retrieved 2014-05-04. ↑ "Criminal Law Reform". American Civil Liberties Union. Retrieved 2014-05-04. ↑ "New England NAACP says African-Americans in U.S. are arrested on marijuana charges at more than three times the rate of whites | PolitiFact Rhode Island". Politifact.com. Retrieved 2014-05-04. ↑ Chris Gentilviso (2013-11-09). "Bipartisan Marijuana Bill Appears To Have One More Big Supporter In Its Corner: The NAACP". Huffingtonpost.com. Retrieved 2014-05-04. ↑ "NAACP Passes Resolution on HR. 1523". NAACP. 2013-11-13. Retrieved 2014-05-04. ↑ Guither, Pete. "Why is Marijuana Illegal". drugwarrant.com. ↑ Loo, M. v., Hoorens, S., Hof, C. v., & Kahan, J. P. (2003). Cannabis policy and social	consequences. Cannabis policy, implementation and outcomes (50-63). Santa Monica, CA: Rand. ↑ Nahas, Gabriel (1985). Keep off the Grass. P.S. Eriksson. ISBN 0-8397-4384-X. 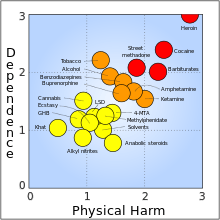 ↑ "Light Drugs, Heavy Consequences". theindiancatholic.com. Zenit News Agency. 2007-06-03. Retrieved 2007-06-10. 1 2 "Marijuana and Medicine: Assessing the Science Base". National Academies Press. 1999. Retrieved 2007-03-30. ↑ "RAND Study Casts Doubt on Claims that Marijuana Acts as "Gateway" to the Use of Cocaine and Heroin.". RAND. 2002-12-02. Retrieved 2007-06-10. 1 2 "The Limited Relevance of Drug Policy: Cannabis in Amsterdam and in San Francisco" (PDF). American Journal of Public Health. 2004. Retrieved 2007-03-20. ↑ "Marijuana Use Per Se Not a 'Gateway' To Illicit Drug Use, Study Says". NORML. 2006-12-07. Retrieved 2007-06-09. ↑ "Predictors of Marijuana Use in Adolescents Before and After Licit Drug Use: Examination of the Gateway Hypothesis". American Journal of Psychiatry. December 2006. Retrieved 2007-06-09. ↑ "Risk of Marijuana's 'Gateway Effect' Overblown, New Research Shows". Science Daily. 2010-09-02. Retrieved 2010-12-24. ↑ "Fact 9: Europe's More Liberal Drug Policies Are Not the Right Model for America". Drug Enforcement Administration. Retrieved 2007-04-17. 1 2 Daly, Max (2007-03-23). "Is cannabis really a killer?". BBC. Retrieved 2007-04-17. ↑ Morris; et al. (March 26, 2014). "The Effect of Medical Marijuana Laws on Crime: Evidence from State Panel Data, 1990-2006". PLoS ONE. 9: e92816. doi:10.1371/journal.pone.0092816. Retrieved 12 June 2014. ↑ "Speaking Out Against Drug Legalization, Fact 6". Drug Enforcement Administration. May 2006. Retrieved 2007-03-26. ↑ "Opponents Take Aim At Marijuana Amendment". CBS: Denver. 2006-09-20. Archived from the original on September 20, 2006. Retrieved 2007-04-19. 1 2 "Marijuana policy and prevalence". Cedro-uva.org. Retrieved 2010-09-15. ↑ "Election 2004: Oakland Marijuana Measure in the Bag". journalism.berkeley.edu. Retrieved 2008-07-07. ↑ "Ron Paul on marijuana laws". YouTube. Retrieved 2008-01-02. ↑ The Revolution: A Manifesto. Grand Central Publishing. ↑ "Part 2 - Mike Gravel - The Issues that Matter - Washington Journal.". YouTube. Retrieved 2007-06-13. 1 2 Sarah Pulliam Bailey (2014-02-03). "Faith leaders wrestle over growing support for marijuana". Religionnews.com. Retrieved 2014-05-04.